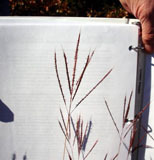 Cespitose grass with erect or decumbent-spreading culms 30-60cm tall, rounded sheaths and flate blades; inforescence a terminal panicle, spikelets on few to several spicate primary branches. Panicle axis shorter than the branches; sessile spikelets never pitted. Ecological Threat: Very serious ecological threat due to widespread planting by ranchers and highway departments. Biology & Spread: Primarily spread intentionally by man for cattle forage and as a component of roadside vegetation. Reproduces by seeds. History: Widely planted for grazing and on roadsides. 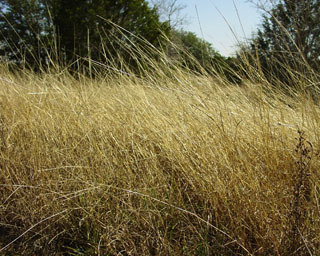 U.S. Habitat: Disturbed mesic, upland soils. Distribution: Widely distributed across the southern half of the US. Timely mowing, burning and herbicide application all suppress this species.